“It is not given to all men to season well.” This line appears on the title page of John Evelyn’s Acetaria: A Discourse of Sallets, which he published in 1699. John Evelyn was a man of many interests and accomplishments, and a highly regarded public figure in Britain in the 17th-century. His Acetaria is one of the more obscure byways he explored in the course of his many and wide-ranging literary pursuits. It is exactly what the title suggests: a book on how to make a good salad. It is also an argument for vegetarianism. Whether one is in sympathy with his views on plant-eating or not, they make interesting reading. John Evelyn takes his herbs and vegetables personally and discourses on them courteously. On the subject of salad, he is both a crank and a gentleman. 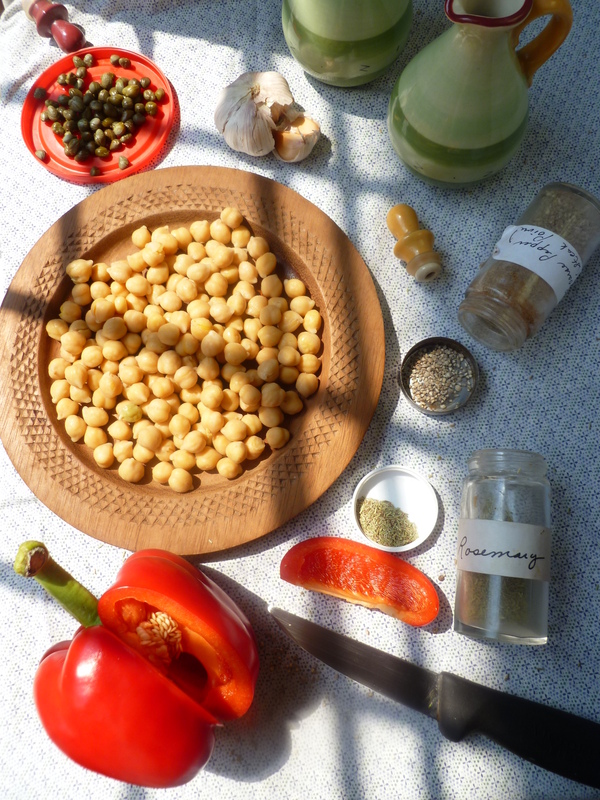 The flavours of roasted garlic and herbs in this Chickpea Salad Provençale develop very satisfactorily when the salad is made a day in advance. Ladies’ palates permitting, and all alike partaking of this good salad….courting would still be alright. 1. Preheat the oven to 350 F. Cut off the pointed top of the head of garlic so that the tops of the cloves are cut through, leaving flat white rounds of garlic exposed. Reserve the cut-off top. 2. Brush the head of garlic well with a Tablespoon of olive oil and grind some black pepper and salt over it. Replace the cut top on the garlic head. Wrap the whole, unpeeled head in aluminum foil and roast it for about 30 – 40 minutes, or until it is tender. 3. Unwrap and cool the roasted head of garlic and press the roasted cloves out of their paper skins. They will come out easily. 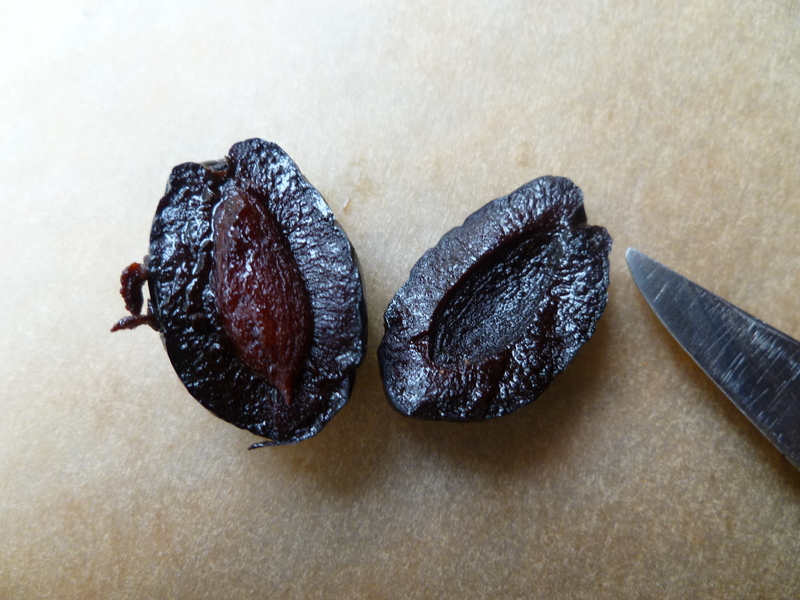 Smash them into a paste with the teaspoon of salt, either using a mortar and pestle or the flat side of a broad-bladed knife on a cutting board. Put the paste in a small bowl. 3. 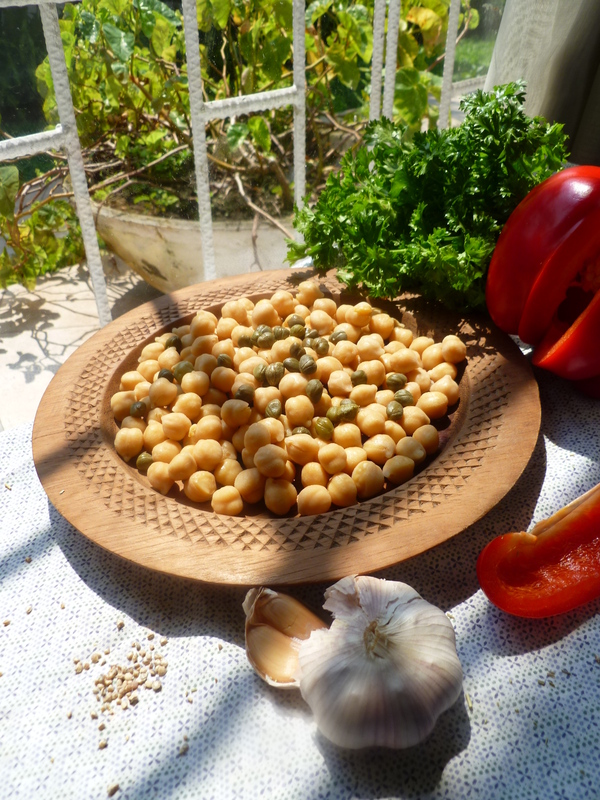 Place the chickpeas, rosemary, red bell pepper, shallot, parsley, tomato cubes, capers, and olives (if included) in a bowl. 4. 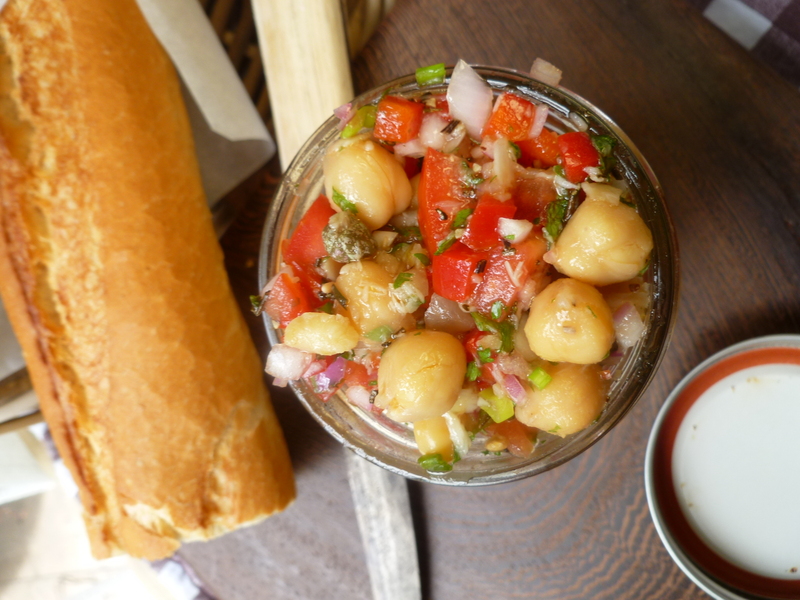 Whisk together the garlic paste and red wine vinegar. Still whisking, slowly add the olive oil. 3. Pour the vinaigrette over the salad ingredients and mix everything together well. If the salad is being used on the same day that it is made, cover it and let it marinate at room temperature until it’s served. Otherwise, marinate it overnight in the refrigerator. 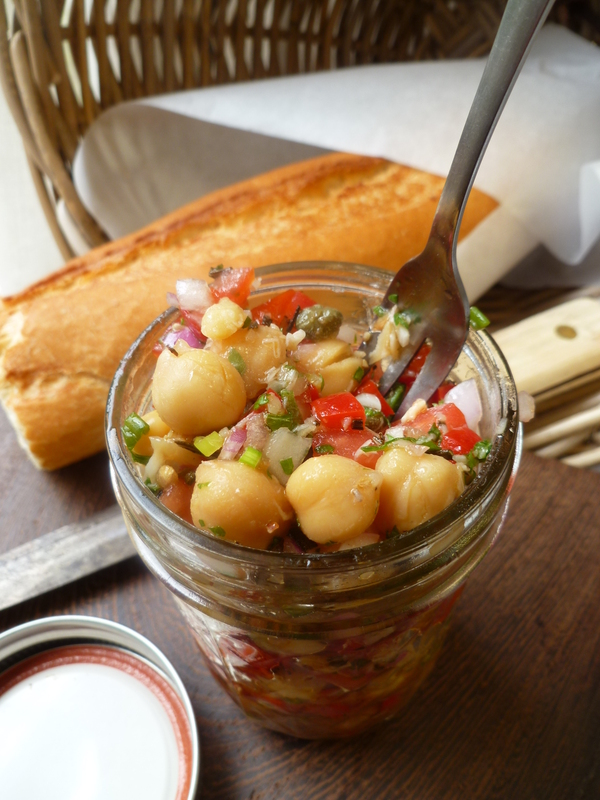 Mason jars are useful for packing the salad to take on a picnic. 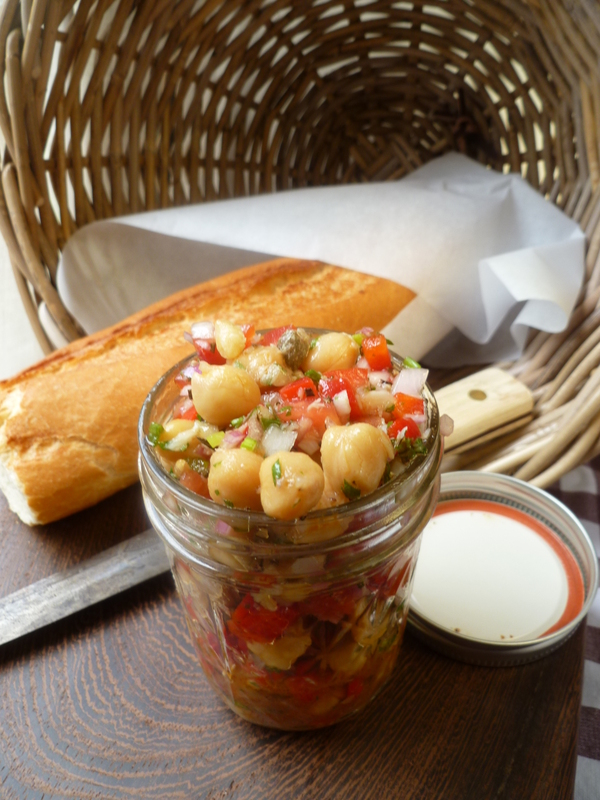 A Note: Chickpea Salad Provençale is on the Occasional Menu: Into the Picnic Basket. And a Second Note: A copy of John Evelyn’s Acetaria may had for free online here at Gutenberg.org. Recipes in Acetaria are included in an Appendix that begins on page 126 of the text.